This unique experience offers you and your family the first-hand opportunity to ride in these workhorse trucks as well as photo opportunities both at the Hotel as well and around scenic Estes Park! The rides will be available for children and adults ages 2+ and each rides will include a picture and certificate. 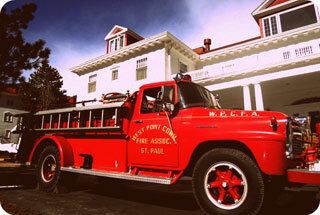 Additionally, the Museum will have fireman’s uniforms and hats for sale. The cost is $15 each and includes a commemorative certificates. The 1960 International originally served in St. Paul Minnesota, exclusively. After it was retired, it was sold to the township of West Point, Iowa. In approximately 2003, it was sold at auction to an owner out of Salina, KS. At that point he had several fire trucks and decided to put this one in the auction for the American Truck Historical Society (ATHS) at the annual meeting in Hutchinson, KS in 2006. From Hutchison, KS the most recent owner also purchased the truck in auction and transported it to Richfield, UT (their residence). Since then, the truck has proudly served in the 4th of July Parade each year, was used in story time at the local library and has attended the local ATHS truck show in Salina, Kansas. This engine spent its formidable years in Bloomfield, Connecticut from its build until the late 1980s. From Connecticut, it was sold to a collector in Indiana and then to another in Texas, where it was most recently housed before The Stanley Steam Car Museum.